think it’s impossible to 10x your current accomplishments? have read 7 Habits of Highly Effective People? are familiar with Richard Branson’s approach? If you’ve read the book, or are familiar with Richard Branson, you may believe me. And that, my friends, is a manager’s most powerful tool! I’ve been doing that for over 4 months now with my assistant and with different collaborators on the 6–7 projects I’m working on at the same time. People often ask me how I cope with doing all these things? How do I find the energy? How many hours a day do I have? I focus my energy on my strengths and delegate to collaborators to cover for my weaknesses. Now now, I’m not saying that Stewardship Delegation is easy. What do you think of the excuses below? How do I rank in terms of expertise level at the task? Are you 5? a 7? a 9? As much as you can, delegate tasks for which you think you’re a 7 or below. Find a 8, 9 or 10 to do the job. If you’re in a competitive field, time spent on tasks where you can’t get the results of a top performer is time wasted. It really does take time. You’re building relationships after all. It will be slower at the beginning, especially if you’re already a 6 or 7, or above. As a producer, you’ve got 24 hours of your own skills to work with. As an effective manager, you’ve got a pool of collaborators, each adding their own “24 hours” of their own skills to work with. 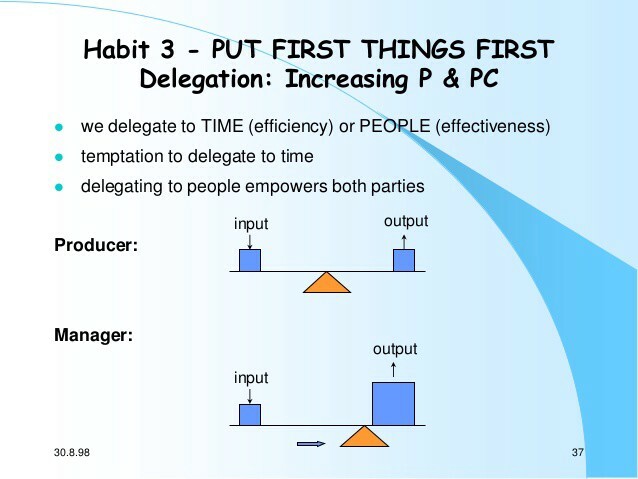 Using the principles for effective Stewardship Delegation below, you can more effectively save time on delegation. I hate doing that myself. What if, to make up for a severe lack of knowledge in something, you delegate to a true expert. For example, if you’re a 2 in something, don’t delegate to a 7 or below. Delegate to a 9 or 10. It’s usually fine to delegate to someone +/- 2 points from you. But when your own score is so low, you have to find an expert to make up for that severe knowledge. Stewardship Delegation is all about results, not the methods. It’s the what, not the how. You tell your collaborator what you need, not how you need it to be done. Be clear and precise about the results. Aim for one concise sentence. Identify parameters your collaborator should operate on. Don’t tell them how to do it, but do tell them how you don’t want it to be done. Give them restrictions. Tell them paths to failures if you know them. Be honest. Who or what is at your collaborator’s disposal? Provide them with human, financial, technical, or organizational resources. Set up the standards of performance, then make them responsible for the results. Be very clear of that. Tell them what happens if they’re doing good, or if they’re doing bad. Using Stewardship Delegation is a powerful method for accomplishing 10x more. Trust in your collaborator, and remember that trust is one of the greatest forms of motivation. Be there for your collaborator. Get involved in their training and development. I’ve more than achieved 10x of my results from 5–6 months ago. Since then, I released 2 books, started 2 other companies, released a video game, and more. Overall, on a day to day basis, I collaborate with about 15 people across 6–7 different projects. Find great collaborators, apply the principles above, and reap the rewards of Stewardship Delegation.